Here is a sign at the Wright Brothers National Memorial that is kind of funny. 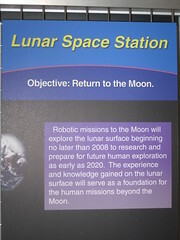 It was from a few years ago and said we would be sending robots to the moon "beginning no later than 2008." Oops! Guess it might be time to replace the sign since it did not happen.